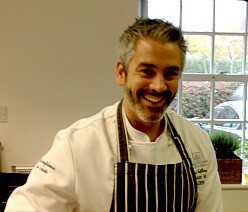 Mark Tilling held the title UK Chocolate Master for four years. He has twice beat off the home competition and gone on to represent the UK in the bi-annual World Masters. After two goes you are obliged to stand aside and give someone else a chance. And Mark is a generous soul so since achieving overall 7th in his second Masters, with his entremet and his showpiece marked even higher at 4th, he has devoted much time to training and advising the subsequent UK entries and winners. He has also been centrally involved in the Junior UK Masters. I have known Mark for some years. 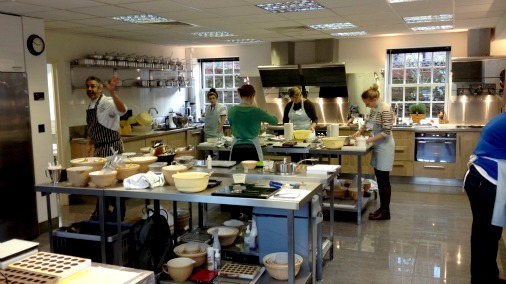 We met at Squires International Cookery School, where in his role as senior tutor he teaches classes at all levels. You don’t have to be a budding chocolate Master to gain the benefit of his experience. 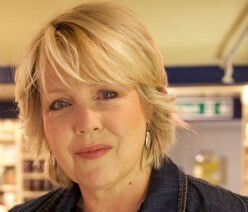 I have taught at Squires too, in my guise of Cookie Bellair, baking columnist of Cakes & Sugarcraft magazine. I love the teaching kitchen there. It is spacious, light and efficient, and yet with its lipstick bright Kitchenaids and masonware bowls it feels like a proper kitchen, not a school or a showroom. Some of you will have seen it when Great British Bake off used it for their wedding cake special last year. The gorgeous kitchen at Squires International School, and Mark giving me a wave. I wanted to interview Mark, but also to see him in action teaching. So I spent two happy, busy, productive, chocolatey days attending his advanced chocolate truffles course. It was fun to be on the other side of the bench, a busman’s holiday. 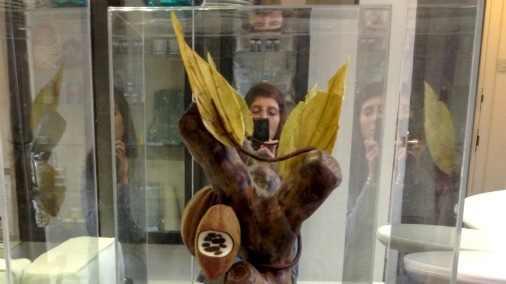 There is evidence of this at Squires in the shape of his recent showpiece from Hotel Olympia, it is pretty staggering to think this is made of chocolate. A detail of Mark's beautiful showpiece for Hotel Olympia (forgive the lousy photo). Happily our aims for the two days are less ambitious. They are also possibly rather tastier, although I couldn’t be sure, never having been given free rein to chow down on one of Mark’s creations. I don’t think that eating the sculpture is quite the done thing. Our mission, in two days, was to make five different filled chocolates. A dark chocolate earl grey tea ganache in a dark moulded square shell, a dark Madagascan ganache topped by a passion fruit mango chilli jam in a milk chocolate domed shell, a gingerbread square that would be hand dipped, hazelnut praline to go in mini milk chocolate spheres that would then be hand dipped and coated, and a saffron infused caramel that we would make into dark shelled truffles and some dipped and decorated chocopops. My fellow students were a happy and engaged bunch, ranging from serious foodies with no excuse for being there other than chocolate obsession, to others at various stages with their own chocolate or patisserie businesses wanting to advance their skills by learning from the master. Much of the first day was spent making elements of the chocolates, which would then all come together the following. 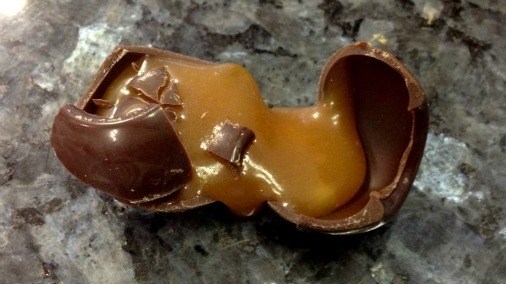 Our caramel, for example, and the moulded shells for the shaped chocolates. 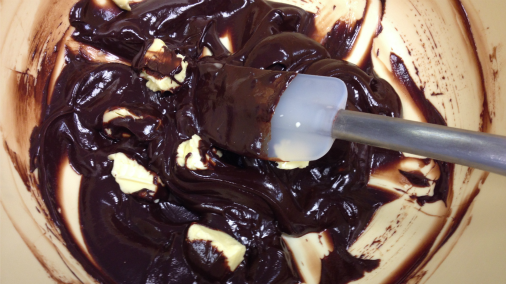 We even got as far as piping in the fillings for our passion fruit layered chocolate. I was particularly excited about this one. Partly because I have enjoyed tasting a few great fruit/ganache layered combos at the International Chocolate Awards and wanted to see how I could do. Also, Mark had told us with evident pride that this recipe formed part of his first Master’s World finals, and that it received much positive attention. The domed silicone mould splattered with red cocoa butter 'paint' ready to fill. Under Mark’s tutelage, everything ran smoothly, ganaches were made, fruit jams set as expected, layers stayed in place, the requisite shine and snap was achieved, splashes of coloured cocoa butter produced artful decoration on miraculously even domes. In short every one of us spent the happiest of two days, watching an ever-growing pile of utterly professional looking chocolates grow in front of us. 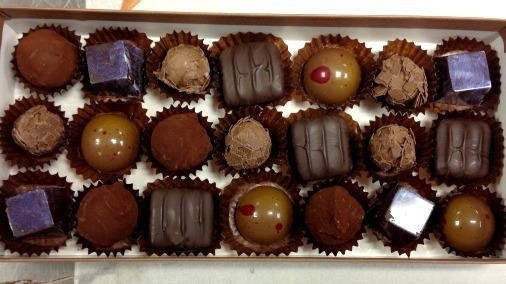 It is a joy to make chocolates, deeply satisfying to spend time so productively. 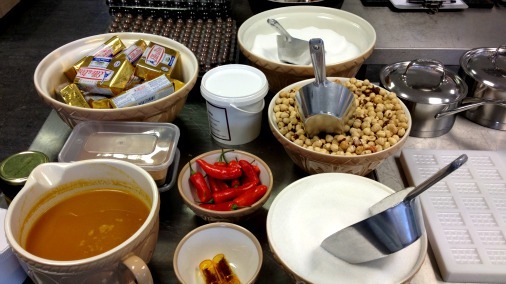 With the machinery and ingredients all good to go, and Mark on hand to inform and advise, it all felt joyfully easy. At home later the recipients of my labours were a bit gobsmacked that I had done so much, so well, in such a short time. It didn’t hurt that I was given countless lovely boxes and shiny ribbons to wrap it all up in. Some of the fruits of my labours. Not too shabby eh! It is clear Mark loves teaching, despite a punishing schedule he is always smiling. 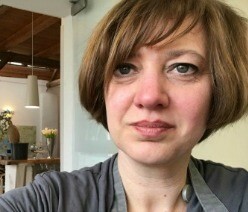 Some patissiers and chocolatiers with an award winning reputation, want to focus on own-name chocolates, or write books. Mark has done these things, he periodically makes fine chocolates that sell through Squires Kitchen’s Alladin’s cave of a shop, and he has brought out two books in the last couple of years, one on macarons, the other on chocolate, and has a third coming out during 2013. However Mark seems to have a genuine vocation for teaching. Which is a very good thing for the future of competitive chocolatiers in this country.